A Web page that I use regularly is the full list of Australian and New Zealand records on FindMyPast. One of their latest additions is an index to Wallangarra quarantine admission registers 1918-1919. The influenza pandemic of 1918-1920 killed millions of people (between 3% and 5% of the world's population at that time). 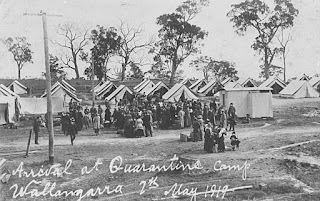 To reduce the spread of this highly contagious disease, people entering Queensland for the first time, or returning from interstate, were detained in quarantine camps at Wallangarra on the Queensland/NSW border. Queensland State Archives hold admission registers for those camps. Information in the database at FindMyPast includes name, year, marital status, occupation, address, what date the person left Queensland (if applicable), and the camp number and Archives reference. The original registers have extra details such as remarks and signatures. There are many reasons why someone could have been travelling between NSW and Queensland, so check whether any of your family are listed in Wallangarra quarantine registers.